This is an album spread from a wedding I photographed at Atlantis Pavilions. A wedding photographer always starts the day, at least in the Toronto area, with the groom's preparation. Besides the traditional photos of the groom, relaxed portraits of the groomsmen are also important. The image of the left feature the groomsmen walking behind the groom and talking with each other. I always find walking shots to look very candid and brides love them. 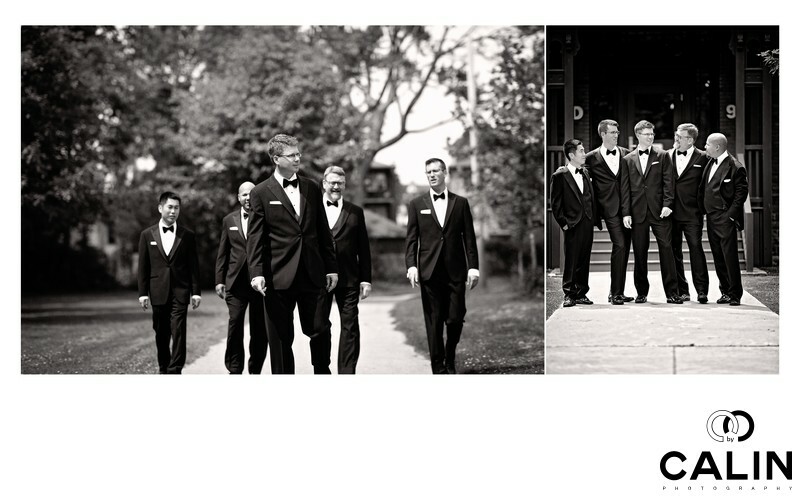 The image on the right features the groomsmen standing together. It is a more traditional more posed photo of the guys and compensate for the dynamism of the image on the left. For this spread I chose a black and white processing.